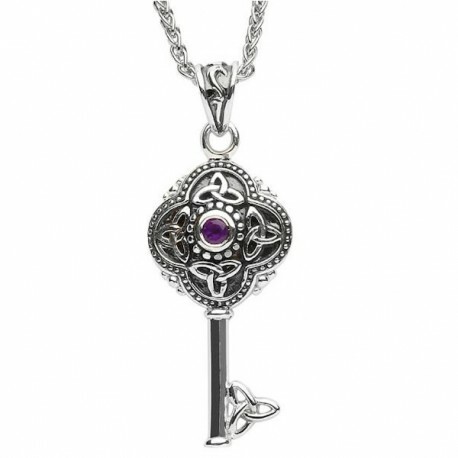 From ShanOre's Celtic Tribal range comes this sterling silver Trinity Knot accented key pendant with sparkling Amethyst gemstone. This carefully crafted key uses a striking and delicate Trinity Knot figure as the teeth of the key. 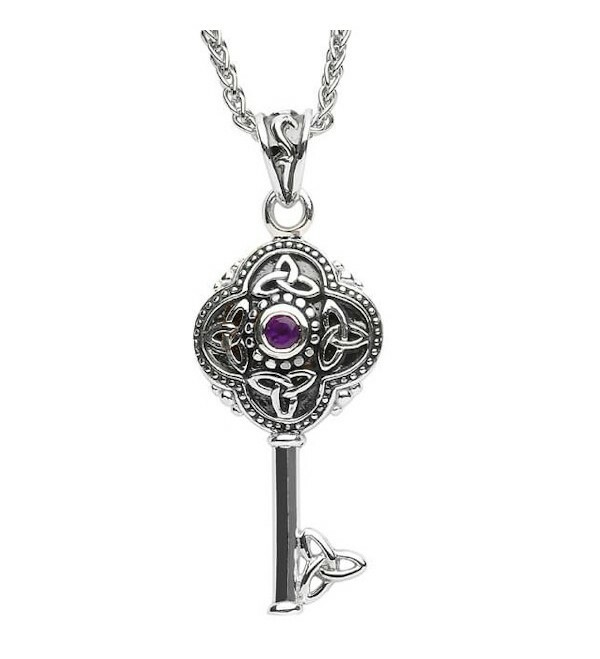 From ShanOre's Celtic Tribal range comes this sterling silver Trinity Knot accented key pendant with sparkling Amethyst gemstone. This carefully crafted key uses a striking and delicate Trinity Knot figure as the teeth of the key. Includes 20-inch silver chain. The Trinity Knots, as featured in this exceptional pendant, are a traditional symbol present in Celtic culture and lore. These interesting symbols are crafted from a single, continuous line that intertwines to form three separate points. Each of the points is significant to their own idea or theme. The meanings may very for the wearer, and may be The Holy Trinity, the past, present, and future, or the three earthly elements. The five, detailed Trinity Knot adornments help accentuate the beauty of the brilliant purple gem. The Amethyst stone is recognized as being suggestive of calming and creative properties. Beautiful and bright, it is said to inspire in its beholder wealth of spiritual and physical realms, and creativity in both body and mind. This stone is perfect for those who appreciate the guidance of art and riches. Let this sterling silver Tribal Celtic Trinity Knot key pendant be your guide. Let it inspire you and surround you with positive and rewarding energies. Elegant for evening wear, but modern in design that it may be worn all day. Gift this to yourself or to a most deserving friend or loved one.